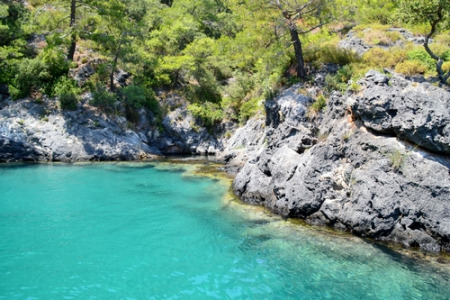 Cheap Altinkum holidays are in high demand and attract visitors of all ages. This is a beautiful area of Turkey where coastal towns are framed by mountains and washed by the warm, clear waters of the Aegean Sea. With safe, sandy beaches that gently slope into the sea, Altinkum holidays are very popular with families, especially those with small children who enjoy paddling and building sand castles. The provision of numerous water sports from fun rides on inflatables to wind surfing and scuba-diving, also satisfies the more energetic holidaymaker. The Aqua Fantasy Park offers fun and excitement for both adults and children. There are a variety of flumes giving varying degrees of thrills to the different age groups. The standards of hotel accommodation and service are high, with the all-inclusive option providing great value for money. There are restaurants catering for all tastes with good provision of international foods as well as traditional fare. Do try local dishes which are both tasty and inexpensive. Those for whom a Altinkum holiday would be incomplete without a shopping trip will be delighted by the extensive range of shops and stores, markets and wayside stalls. You'll have plenty of opportunity for buying your gifts and souvenirs. The town lies in an area that is rich in archaeological remains from Roman times. If you are fascinated by ancient history, you will enjoy a day trip to Ephesus where the site gives an insight into Roman life. With a long season, you can bask in sunshine from early spring to late autumn, and as there are many flights from regional airports travel to Altinkum has never been easier. If you want to travel to Altinkum but find the thought of trawling through web page after web page looking for the best deal a little daunting, try our simple search facility. You'll find over three dozen travel companies, including leading brands, competing for your custom. It is simple to use, and remember, competition brings out the best bargains. Our search facility enables you to see, at a glance, the Altinkum holiday that is the cheapest, and the one that offers the best value for money. It couldn't be easier. All you have to do to secure the holiday is make a phone call. As offers change daily, in order to avoid disappointment, you should ring today.